Given some of the recent technical issues during these first days of GTA Online, and now that things are starting to look much smoother, Rockstar are planning to provide a special stimulus package for all who have played or will play Grand Theft Auto Online this month. They will be dropping a cool half a million GTA $ in the GTA Online bank accounts of all players this month, starting as early as next week. In order to keep the current worldwide in-game economy balanced, they will be providing this GTA $ to players via two deposits of $250,000. 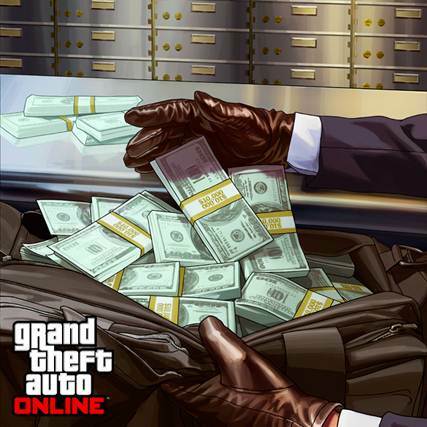 Rockstar will announce specific dates as soon as possible, but are currently planning to be able to make the first deposit by the end of next week (after we’ve confirmed that issues causing game progress loss have been fixed) with the second installment to happen by the end of the month. Below are a few more details on how it will work. Stay tuned for tips on how to make the most of GTA $ cash, info on ways and places to earn more cash fast, as well as updates on all the new GTA Online content additions we’re working on for this fall and beyond. You must play or have played Grand Theft Auto Online at any time during the month of October 2013 in order to qualify for the GTA $500,000 deposit in your in-game bank account. Players will first have to install a forthcoming GTAV title update which is expected to happen next week. That title update (1.04) is expected to fix the remaining instances of issues that have caused vehicle purchase loss and will also enable the functionality through which we’ll be providing this GTA $ stimulus cash to players. Does this make up for the issues? Let us know your thoughts in the comments below.